When visiting Duomo di Milano in Milan, you need to have Time. Time to queue to buy your Ticket, time to queue to go up, enough time to enjoy the 5th-largest church in the world and time to visit Museo del Duomo di Milano. With some simple Tricks, you can save Time and even Money in Advance. Through some Luck, I figured it out, and a little research before my visit to Milan. Read here now where to buy your Duomo di Milano Tickets, and find out about the different types of available Tickets. There are several Types of Duomo di Milano Tickets that can be purchased to visit Milan’s Cathedral. Besides the regular Tickets, Audioguides can be borrowed for a visit, read more about them here in English. to all the above for children up to 6 years old; disabled with helper; members of the military, after the presentation of a valid military identification card. Now that you know what different Types of Duomo di Milano Tickets are offered, it’s about where to buy them. You can either do it in Milan, at five different selling points or online. If you are visiting with Kids younger than 6 Years, or are authorised for a discount, you should buy these at any of the 5 Duomo di Milano Ticket Offices. Otherwise, you can buy them online in advance here like regular concert tickets and print them out. With Tickets you can skip all the endless queues, enjoy! When I went to visit Duomo di Milano, the Queue wasn’t that big, but after I waited for more than 20 Minutes and there was still no end in sight, I switched from selling Point 2 to Point Number 5. This Duomo di Milano Tickets selling point is located in Palazzo Reale, where you can find Museo del Duomo di Milano. There were just five people (unbelievable after I waited behind dozens of people for almost half an hour!) and within less than 10 Minutes I had my Ticket! Either if you want to visit the Museo, which is an Archive of all the Statues and Exhibited Items, or not, the less frequented selling points are highly recommendable. Or, of course, go there as one of the very first in the Morning. In the meantime, there are now only four selling points for Duomo di Milano Tickets. You can find them on the Picture below. Amazing tip!!! Thank you so much! if i buy the tour at off site = https://www.duomomilano.it/en/ . does it mean i can just enter to the cathedral ans skip the line at ticket counter? no need to exchange to ticket counter, is that so? I was in the process of booking the duomo tickets, but I noticed that they are adding an extra charge of Euro 9.99 for delivery charges. I was wondering why they are charging that amount when it is possible to receive them by email or printing them out. Are you aware of this? Wow, this seems ridiculously high, I’ve never heard of a delivery charge this high… on what website did you try to book the tickets? Thanks for the advice! If I buy a ticket online, but need to pick it up at the „venue box office“ would that take the same amount of time that buying the tickets in person would take? I am arriving in Milan the first week of August 2017. Also, is the museum closed on Mondays? Hello Bianca, we would like to visit the Duomo Cathedral and the Terrace but we are not sure whether we need to pay for the entrance fee for visiting the Cathedral? We will visit Milan in July. Thank you. You can find all the prices above, for the passes and the individual prices. Enjoy your visit to Milan! Bianca, thank you so much for the reply. Have a great day! I want to buy Pass A which I believe is category 1 which says not available. Category 2 I believe is by foot but I want to go up by the lift. Or shall I just get the tickets when I am there in September morning? Really appreciate your thoughts on this! Thank you very much! 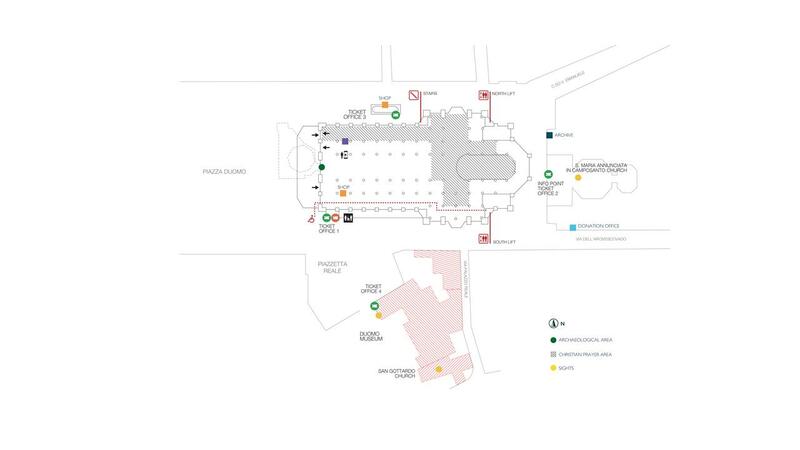 I understand your confusion as it seems that they changed their homepage a bit.. On this site https://www.duomomilano.it/en/buy-tickets/ you can, still, find the available Passes – Pass A in combination with the Lift. If you want to buy the Tickets the same day of your visit you can plan a bit better if the weather is good or not (visiting the Top of Duomo during Rain is even a bit dangerous as the stairs can get slippery), and if you visit a less frequent selling point (like the Museo one) you won’t have to wait too long. Hope I could help and I wish you a nice time in beautiful Milan! Thank you for the Tip to purchase the Tickets online! Where do I have to go with them?